“We have to legally own the property to do much with it,” Matherly said in an interview before the council meeting. Monday’s 5-0 vote on an ordinance sponsored by Matherly and Councilman David Pruhs enables the city to begin a process of acquiring ownership of the Polaris through foreclosure. Joy Huntington was absent. 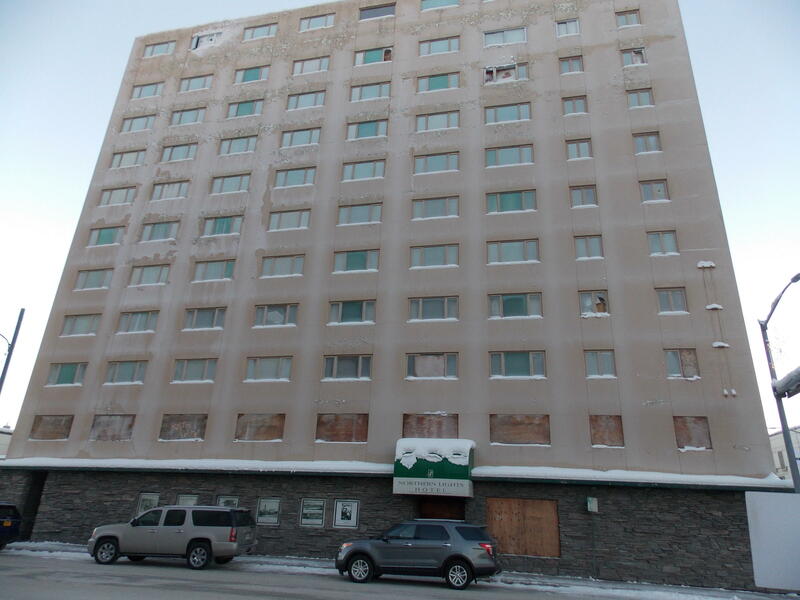 The measure authorizes the city to pay $49,000 to the borough to cover property taxes that Anchorage developer Marc Marlow, who owns the structure, has failed to pay since 2015. Matherly says passage of the ordinance enables the city to seek funding to help pay the $4 million demolition cost. “By putting it into our hands, it gives us a lot more power to obtain federal funds, to obtain state funds – any kind of help that we can get to tear it down,” Matherly said. City officials say Marlow hasn’t responded to their concerns. He also didn’t return phone calls for this story. The mayor says it’ll take a while for the city to finally arrange a date with the wrecking ball for the Polaris. He says it’ll most likely take a while for the legal process to get to that point – sort of like the slow pace at which the city has had to proceed since it and the Downtown Association of Fairbanks began working in earnest on the project in 2015. Matherly said during Monday’s meeting it’s still possible Marlow will pay the more than $54,000 he owes the borough for 2015’s back taxes, and retain ownership of the Polaris. Regardless, the mayor says the city will move quickly to secure the building to keep vandals and thrill-seekers from breaking-in to it. Fairbanks police have responded to nearly 100 complaints for break-ins and other such activity since 2009. Besides the nuisance, the vandals also risk exposure to such contaminants as asbestos and black mold that’s spread throughout the building after years of neglect. Meanwhile, the Downtown Association will continue raising the rest of the $135,000 the city needs to gain ownership of the building. The money will be used to buy the note from a lender who loaned Marlow $130,000. Matherly says the organization already has raised about half that amount.